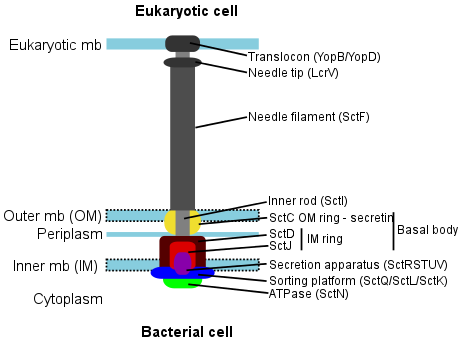 Non-Flagellar Type III Secretion Systems (NF-T3SS, or injectisomes) are bacterial machineries partially homologous to the bacterial flagellum, which allow direct injection of bacterial effectors from bacterial cytoplasm to eukaryotic cells via a molecular needle (cf. schema above). NF-T3SS are found in animal and plant pathogens (Yersinia pestis,Escherichia coli, Burkholderia,...), but also in plant and insect symbionts (e.g., Rhizobiales). This website allows to query a dataset of 216 NF-T3SS retrieved from 1385 complete genome sequences. These systems were detected with proteic profiles of NF-T3SS core genes (sctC, sctN, sctJ, sctQ, sctR, sctS, sctT, sctU, sctV), and with an analysis of the genomic context of the hits obtained. This dataset along with the methodology is described in Abby and Rocha 2012. Proteic profiles and models used for this study are freely available in our web site for systematic searches, in the dedicated Galaxy web server (search for txsscan tool), or in the stsandalone version in conjugtion with MacSyFinder and MacSyView. Citation: Abby SS, Rocha EPC (2012) The Non-Flagellar Type III Secretion System Evolved from the Bacterial Flagellum and Diversified into Host-Cell Adapted Systems. PLoS Genet 8(9): e1002983.